This morning the rain was pouring down on Nairobi’s streets. Rain completely disturbs society here. 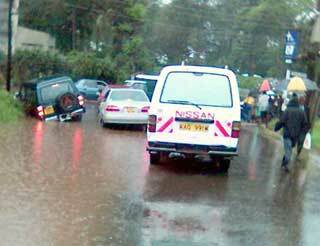 Bad roads, bad drainage are the main reasons of the streets changing into rivers. Matatus get stuck in the mud in areas where most people live, people reach their work too late. Near Kisumu a town on the coast of Lake Victoria, huge floods make people drown. Thousands of children cannot go to school because of the floods. The floods in other parts of this country have to do with deforestation and as a consequence desertification, among others. People cut wood because they prepare their ugali (maize) on char coal stoves. At the same moment a short story went straight into my heart this morning. Last week a total of 18 children were found in town. Even after identification parents did not want their children back. For me it shows what poverty can do with people. Medical staff on strike. They want 600% pay rise.